Lowsley-Williams crashed hard but battled back! 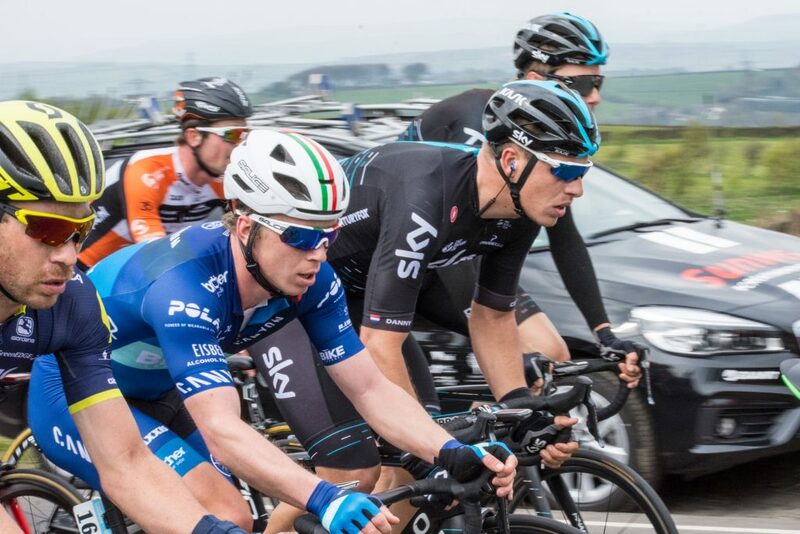 James said: “We had planned from the start for it to be a day for Harry Tanfield to get up in the break. As usual, a few of us were covering the early breaks to make sure we were represented. With the rain coming down hard all morning, it was always going to be a pretty grim start, and then there was 174 km of wind and rain forecast! The beginning of the race was fast, with Harry and I taking turns to cover the breaks. I was feeling good so tried an attack 10km in but unfortunately that attack did not last long as a right-hand corner caught me by surprise. I was carrying a fair bit of speed at the time and in those conditions the brakes don’t work so well. I soon found myself sliding on what felt like an ice-rink from one side of the road to the other. I got up and pushed on, making the effort to get back into the peloton before assessing the damage. It’s not the greatest feeling crashing hard then having over 100 miles of hard racing to do in front of you. But the adrenaline kicked in and I soon found myself back in the front of the bunch. Harry did a great job in securing the most aggressive rider award for his efforts in the break and then it was our turn to try to get a result. I found myself well positioned on Elia Viviani’s wheel with three kilometres to go. But with 600m left my legs exploded and I ran out of gas. So unfortunately there was no big result but there are plenty of more chances to come. As for the injuries, I have got a fair bit of road rash and a swollen knee.